Mash 3 cups sliced strawberries with 1 cup sugar in a saucepan over medium heat. Bring strawberry mixture to a boil, stirring frequently. Mix cornstarch with water in a small bowl and pour into mashed strawberries; reduce heat to medium-low. Let strawberry mixture simmer, stirring constantly, until thickened, about 10 minutes. Set aside. Bring half-and-half to a boil in a saucepan; remove from heat. Beat egg and egg yolk with an electric mixer in a bowl until frothy; gradually mix in 3/4 cup of sugar, then beat until the egg mixture is thick, pale yellow, and forms a ribbon when beater is lifted out of the bowl, about 3 minutes. Gradually pour hot half-and-half into the egg mixture in a steady stream, beating constantly. Return mixture to the saucepan and place over medium heat. Cook, stirring constantly with a wooden spoon, until the custard thickens and starts to boil. Reduce heat to medium-low; continue cooking, stirring constantly until flour is cooked, 2 to 3 more minutes. Remove custard from heat, and stir in butter and vanilla extract. Spread custard in an even layer over the bottom of graham cracker crust. Top the custard with the cooked strawberry mixture. Arrange fresh strawberries over the top. Chill at least 3 hours before serving. 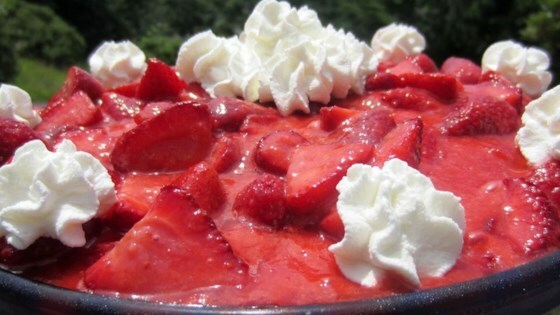 You won’t believe how easy, and tasty, this strawberry pie is. This pie is amazing, totally worth making. But its SUPER sweet. Great combination of my favorites--in-season strawberries, custard, and graham cracker crust. I used a vanilla bean for the custard, but otherwise stuck to the recipe.